Fire is an important natural process in many ecosystems throughout Florida. Fires historically occurred in relatively frequent intervals for some of these habitats (2-7 years). Many plants and animals evolved around this powerful process, and some even require fire to properly flourish. As people expand into and take over these fire-adapted ecosystems, fires are often suppressed in the name of public safety. What often happens is that these ecosystems become extremely congested with undergrowth. That undergrowth tends to be comprised of species that are flammable due to having evolved with fire. These fire-suppressed areas then become a sort of ticking time bomb waiting to ignite. When there is too much fuel, as in these scenarios, the inevitable fire burns too hot and for too long, consuming everything in its path. It's sort of ironic that fire suppression eventually leads to the biggest and most destructive fires. This is part of the problem that California faced recently and will likely continue to face. 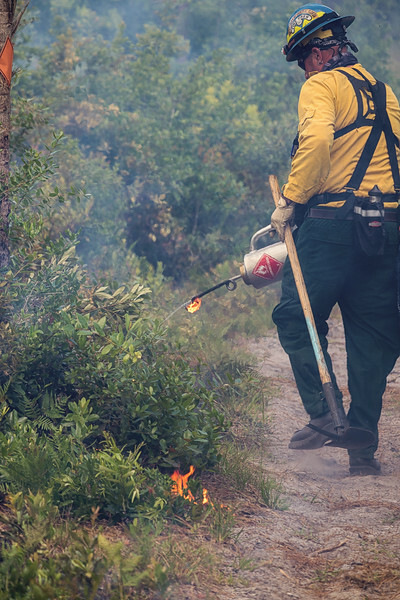 In Florida we have a system of people and agencies who plan and carry out successful prescribed and controlled fires that not only maintain a vital ecosystem process, but also prevent massive destructive fires that threaten everything in their path. These photos were taken at the University of Central Florida's Arboretum on campus during a controlled burn. I was provided access to photograph the process as well as the crew controlling the burn.